It's all about love during the Valentine's Week. Each day of the Valentine's week will present one book love story with a different genre insight. Today, it's all about horrors. 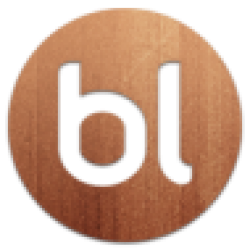 We're happy to welcome Charlene from Char's Horror Corner on BookLikes blog. 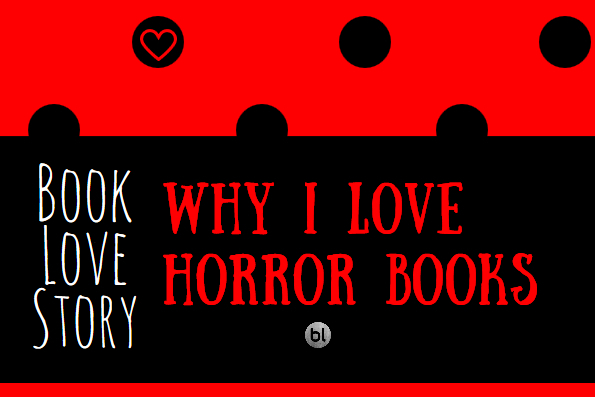 My love for horror is great, so when Kate from BookLikes asked me if I would be interested in writing about why, I hopped on the chance! When I was young, there were very few children in my neighborhood, so I spent a lot of my time reading. The Bookmobile would come around once a week and I would check out as many books as I could hold. Back then, (only allowed to check out children's and young adult books), it was Agatha Christie, Edgar Allan Poe and Sir Conan Doyle that tickled my fancy. Poe-especially. I remember reading his story The Black Cat and getting a delicious case of the shivers-and so my love of horror was born! When I got a little older my parents used to bring me to the drive-in theater for horror movie marathons. (For those who don't know, Drive-ins were theaters you attended while in your car. You pulled up to these speaker stands, removed the speaker and hung it on your car window and Voila! Movie sound! These days, I don't go in for horror films as much as I used to-but my love of horror books remains the same. So, why is that? What is it about horror books that I find appealing? Well, there's the aforementioned "delicious shivers" and I still love to get them. You know-that feeling you get when you're reading a scary book all alone in your house and you hear a noise? That little bead of sweat that breaks out on your brow while you're hunting down the cause of that mysterious noise? Yeah, that's one reason for sure. Another is because horror is often about outsiders. I was not exactly a cool kid in high school. 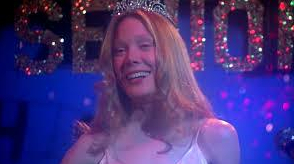 I wasn't exactly a "Carrie" either- but I could identify with her. Not having the "right clothes", not having the "cool" friends, etc... When I first read Carrie, I felt so terrible for her and what she went through. I didn't condone her actions, but I certainly understood them. Since I felt I could relate to outsiders, it stands to reason that I would enjoy reading stories about them. Another thing I love about horror is all of its different facets. I think there are more aspects to horror today than ever before. Let's examine some of my favorite aspects and tropes below. Atmospheric and/or mood driven horror. This is the type of horror that slowly builds over the course of the story, usually creating a sense of tension, (often, with little to no actual blood or gore), that if done right, pays off with a denouement of epic proportions. Michael McDowell's The Elementals is a perfect example of this type of story. The characters are vividly drawn and memorable and as the story unfolds, you can feel the tension settling in around your neck and shoulders. You can't quite put your finger on why, (at least not until close to that savory ending), but you just KNOW that when "it" arrives, it is NOT going to be good. Splatterpunk Wikipedia says: "Splatterpunk was a movement within horror fiction in the 1980's distinguished by its graphic, often gory, depiction of violence and 'hyperintensive horror' with no limits." In my opinion, there is room for super gory fun in horror fiction. (My friend here at BookLikes, Grimlock, helped me to better define the Splatterpunk genre and turned me on to some great books, back when we both met on Goodreads, years ago.) These days, I lean more towards the atmospheric type of horror, but Splatterpunk will always hold a special place in my heart. Some great examples would be Skipp and Spector's The Light at the End or The Books of blood by Clive Barker. Cosmic Horror. Back in the day, (1908 to be exact), William Hope Hodgson wrote a story called The House on the Borderland. Many years later, H.P. Lovecraft would cite this story as one of his biggest influences. Terry Pratchett named it as one of his big influences as well. Why is that? The answer is not totally clear, but one of the reasons might be because the depiction of the cosmos as cold and unfeeling and the depiction of humanity as insignificant –well, those are scary thoughts! Lovecraft later took this idea and made it his own, with the creation of all kinds of cosmic gods and the cursed elements of mankind that served them. This type of horror is now usually referred to as "Lovecraftian". These days, H. P. Lovecraft is more clearly seen as the racist he was, but the mark he and Hodgson have made upon the horror genre and legions of authors cannot be denied. Creature Features. These types of stories are some of the most fun that horror has to offer. I like to think of them as the B-movies of the horror genre. They are generally fast paced and feature creatures, (see what I did there? ), whose only reason for existence is to kill humans. There is usually not a lot of moralizing, (though some of these do highlight an environmental message), and as such they can be a heck of a lot of fun to read. Some of my favorites include: The Rats by James Herbert, Clickers by J.F. Gonzalez and Night Of The Crabs by Guy N. Smith . Supernatural Horror and Legends of Horror will be my last word on the subject of horror today. These terms encompass so many types and creatures of horror- it's almost too large of a subject to tackle here. Probably my favorite type of supernatural horror would be the kind that is never fully explained-or might not even exist at all. An AWESOME example of this type of story is The House Next Door by Anne Rivers Siddons. This is a tale where a LOT is left up to the reader's interpretation-(usually these types of books lead to the very best discussions! The Supernatural aspect can also include stories of ghosts, (or not ghosts as in Henry James' The Turn of the Screw), vampires, (not Twilight vampires though, because those are YA and romance, NOT HORROR), and all sorts of creatures of myth and legend like Werewolves, Wendigos, The Jersey Devil, Bigfoot, Witches, etc... There is so much quality dark fiction available about all of these subjects, so a horror fan will never find themselves short of great material to read! So there you have it! These are just some of the reasons I love horror so much. It appeals to outsiders, insiders and everyone in between. There is often a horror story for every sort of reader, be they full of jump scares, blood and guts or just mysterious things, glimpsed out of the corners of your eyes. Horror can be intelligent and hard to fathom, or it can be stupid, blood and guts. It’s up to you! One thing is sure though, a good horror story is GREAT fun and I hope you have yourself some this year! Watch out for more Book Love Stories on BookLikes blog this week! If you'd like to join, please do! Write your book love story on your blog and add the link in the comment section below. Make sure to add why I love tag to your post so we could find it and share it.